Tens of millions of Americans currently live in poverty, more and more of them in extreme poverty. But the words we use to describe them tend to obscure rather than illuminate the human lives and real-life stories behind the statistics. A “sympathetic social history that allows poor people, past and present, to tell their own remarkably similar stories” (Booklist), A People’s History of Poverty in America movingly brings to life poor people’s everyday battles for dignity and respect in the face of the judgment, control, and disdain that are all too often the price they must pay for charity and government aid. 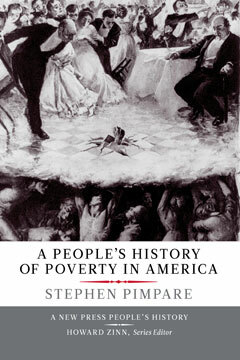 Through prodigious research, Stephen Pimpare has unearthed poignant and often surprising testimonies and accounts that range from the early days of the United States to the complex social and economic terrain of the present. A work of sweeping analysis, A People’s History of Poverty in America reminds us that poverty is not in itself a moral failure, though our failure to understand it may well be.